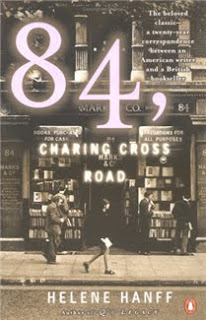 When we got to talking about film adaptations yesterday, I knew today's Retro Friday post would have to be about one book, and one book only--84, Charing Cross Road by Helene Hanff. I owe the discovery of this wonderful book to DH, before he was DH, in fact. He gave the movie to me for my birthday--the first birthday I had after we started dating. Along with the Old Friends Simon & Garfunkel box set and a kiss. At the time we were living in different cities and meeting up somewhere in the middle for our "dates." So I drove home that night and watched the movie all by myself. I cried. Twice. I laughed and laughed and laughed. And I went out and bought the book immediately. I was on my way to London for a study abroad program and so it was a going away gift of sorts. He's particularly good with gifts, as you can tell. It is without a doubt my very favorite memoir and the movie adaptation starring Anne Bancroft and Anthony Hopkins is pretty much my favorite movie of all time. Just another of those little things that my man brought to my life that I might never have found without him. Your ad in the Saturday Review of Literature says that you specialize in out-of-print books. The phrase "antiquarian booksellers" scares me somewhat, as I equate "antique" with expensive. I am a poor writer with an antiquarian taste in books and all the things I want are impossible to get over here except in very expensive rare editions, or in Barnes and Noble's grimy, marked-up schoolboy copies. And that is how this exquisite little gem of bibliophilia begins. Frank Doell answers Miss Hanff's letter on behalf of Marks & Co., signing his letter FPD. Over the course of twenty years, these two book lovers exchange letters and, in the process, become fast friends. Though they never actually meet, their friendship spans years, nationalities, personalities, and an ocean. It's hard for me to express how much I love this collection of letters. I'm always wanting to talk about it with other readers but know few outside my immediate family who've heard of it let alone read it. Which is sad as, when I think about books about books and book lovers, I have a difficult time coming up with a better, more moving and intensely personal story. It doesn't hurt that I'm extremely tactile when it comes to my love of books. I adore owning multiple editions, particularly old, used, loved copies picked up in used bookshops around the world. The day I walked into Hay-on-Wye I promptly broke out into a cold sweat at the sheer number of "antiquarian booksellers" within a one-mile radius. 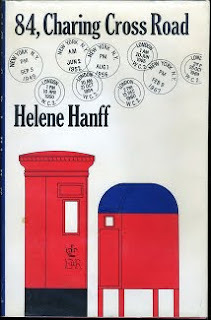 And in this book, Helene Hanff's love for the physical books themselves, the words within, and British literature especially just suffuses this reader with joy and a beautiful sense of camaraderie. I'll close with one of my favorite passages and the hope that, if you haven't picked 84, Charing Cross Road up yet, you will. And come back and tell me how it was. Last of all, here for your viewing pleasure is the trailer for the movie. Just watch it and you'll see what I mean. This has long been one of my favorite books and also one of my favorite movies. I saw the movie when it came out in the theater (with about 3 other people in the audience - sigh). Both are wonderful! Liz, oh, that's wonderful! I wish I'd been able to see it in the theater. I've seen this time and again on the shelf, and I have a passing familiarity with the movie, but...Why have I never picked it up? Sounds like I'm going to have to do that the next time I see it. Chelle, it will stick with you long after and packs a big punch for such a short book. Beautiful retro friday post! I've never heard of either the book or the film. Your DH is an exquisite photographer. Does DH stand for Dear Heart? Rhiannon, thank you! I really do love this one. Ah, such a coincidence! I was in Charing Cross Road yesterday, and was tempted to buy this book (displayed in the window of the Bookends bookstore at 108 Charing Cross Road - is that the same shoplot?). I think I will have to get it now. I loved this one too, and when I went to England, I had to walk on Charing Cross Road, just so I could say I did. Karen, is it really? That makes me so happy. And I agree. For anyone who loves books, it's a must read and see. Thanks so much for posting about this book, Angie! You always have such lovely recommendations-I'm sure I'll adore this one! And now I simply have to see the movie. It looks positively adorable! I love both the book and the movie! It is always nice to find another person who feels as I do about it. Thanks! Hi, thanks for a great post about a book and film that I like very much. This is one of those rare instances where both treatments are charged with meaning. I also understand your bewilderment on Hay-on-Wye, which I visited for the first time last year. For a book collector/lover, it can be overwhelming. Rachel, you are most welcome and it really is wonderful. Anthony, it really is a rare occurrence but I can honestly say I get equal pleasure out of both. I've never heard of the book or the movie. After reading your post I had to do a quick search at my library and they have to book, so now it's on my library wishlist =D I have to see the movie as well. I remember loving the film when it came out. But it's been so long that I need to see it again. I'm also going to buy the book and give that a try. I'm really looking forward to both! Thanks for the recommendation, Angie. Ladybug, I'm so glad they have it! Enjoy. I've never read the book which is a bad thing but I grew up with the movie. My mother watched it over and over again and one day I just started watching too. Almost having a happy-cry just thinking about it. I'll read it one day. Until then it's comforting to know it exists. Jane, I get teary every time I think of it as well. My word, those two just nailed their roles. Thanks for sharing your memories of it.